I snorted at the black frost, haha. European Christmas markets are the best; it's not the same here in Aus where it's warm! Hope you have a great Christmas! Ahhh..Christmas songs are just the best!! I whistle them in the shower on repeat and it drives John CRAZY. Bad made-for-TV Christmas movies are my reason for existing! I've often said if I was rich I would just work for free making more of them cause of my deep, deep love. Thanks, Jaime! I can't wait to read about your festive adventures with your fam. I'm kind of on the fence on the whole Christmas jumper thing. I can't decide whether to go full-on, ugly cheesy sweater, or cute and tastefully festive. Hmm ... I'd love to see your collection! Haha! Made me laugh so hard. Glad you can relate. Christmas markets are one of my favorite parts of the season too! And I just got my first ever wreath the other day and I love how it looks on my front door! I love that first picture - what store is that? Feel like I've been there before, but it's bugging me that I can't remember what store it is!! 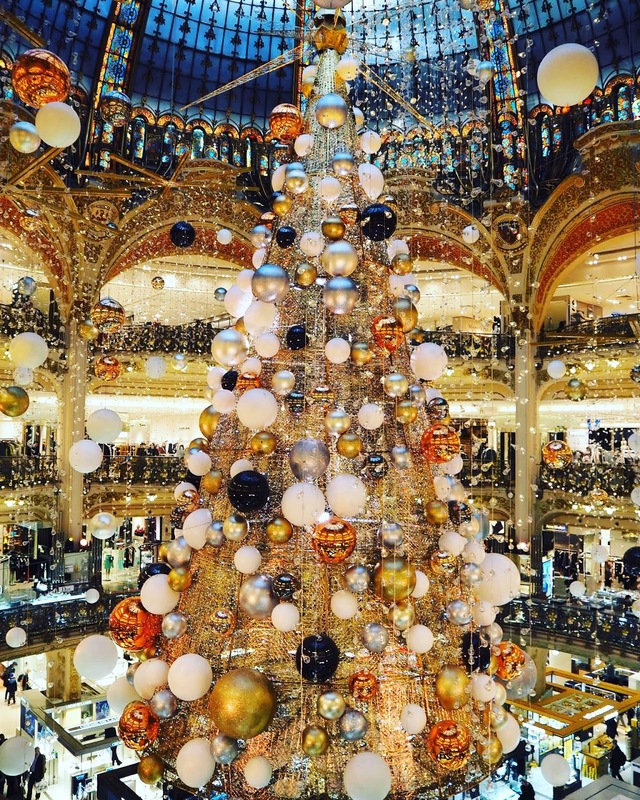 It's Galeries Lafayette in Paris! Yesss, I totally agree with so many of these, especially the tree collecting & magic of Stars Hollow-esque snow falling. I went to my boyfriend's Christmas party recently and definitely stole a wreath from one of the tables. It brought me so much joy! Absolutely - best comfort TV watching ever, for these dark evenings! My mom visited us in Italy and it made Thanksgiving much more special. I hear you on the Christmas music... I'm listening to some good old carols now! Merry Christmas! It must have been wonderful to have your mom with you for Thanksgiving, Scarlett! I always miss my family at Thanksgiving. I can't remember the last time we were able to celebrate it together. Have a brilliant time with your parents! I hope you all stay fed and entertained :) I wrote a list of things to do to make me feel festive, and I'm terribly behind on it already. I haven't even put up my decorations! I need to get my act together. I have however been to see the decorations at Covent Garden and Regent St and they are BEAUTIFUL. So sparkly! Thank you, Rachel! I love all the decorations in London this year. Maybe I'm just noticing them more, but they are really looking so bright and cheery. I walked past St Christopher's Place and Carnaby Street last week and loved the lights and sparkly decorations there! My boyfriends mom went to the christmas markets in Cologne and loved them, so hope you have fun too! This is normally how we pick out our Christmas trees too, but this year went super smoothly, small miracles. Didn't even fall out of the tree stand, double bonus. So glad to hear this, Dannielle - I don't want to get too excited, but I'm also hoping it's going to be beautiful! Loled at your tree story ... right now, I'm staring at a tree topper that my husband described as the "leaning snowflake of Pisa ..."